Bosco Accounting understands that privacy is important to you. Bosco Accounting is committed to treating the personal information we collect in accordance with the Australian Privacy Principles in the Privacy Act 1988 (Cth) (Privacy Act). This policy sets out how Kelly Partners handles personal information. We only collect, hold, use and disclose personal information which is reasonably necessary to ensure that we are able to provide you with the products and services that are appropriate to your needs. We will outline to you when you engage our services the purposes for which we will collect, hold, use and disclose your personal information. Due to the nature of the products and services we provide, and the requirements of legislation and regulations, we ask for a range of personal information from our customers. When we collect, hold, use and disclose personal or sensitive information it must be done through lawful and fair means. Consent must be obtained to collect, hold, use and disclose personal information. We are not required to obtain your consent to collect, hold, use of disclose your personal or sensitive information if the collection is required or authorised by or under an Australian law or a court/tribunal order. There are other exceptions to the requirement of obtaining your consent in accordance with the Australian Privacy Principles. If you would like more information on these requirements, please contact our Privacy Officer. Through use of our website, such as via contact mailboxes or online enquiry forms, or through the registration process (see more information about ‘web analytics’ in Clause 2). In every circumstance we will attempt to obtain such personal and sensitive information directly from you. If that is unreasonable or impracticable, we will attempt to obtain such information from other sources in accordance with Clause 3(a) above. ou should only provide us with someone else’s personal information where you have their express consent to do so and it is for the purpose of us providing services to you. Matters in this policy should be communicated to any person whose information you collect and provide to us. Safeguarding the privacy of your information is important to us. We hold personal information in a combination of secure computer storage facilities and paper based files, and take steps to protect the personal information we hold from misuse, loss, interference, unauthorised access, modification or disclosure. Bosco Accounting trains its employees carefully on handling personal information and confidentiality of such information. Once we have no purpose for holding your personal information, we will take all reasonable steps to destroy or de-identify the information. 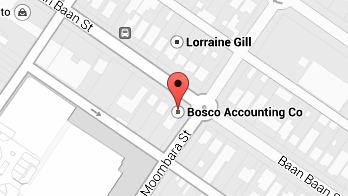 The Bosco Accounting Group has offices throughout New South Wales. To meet the purposes for which your personal information has been collected we may disclose your information to others in the Bosco Accounting Group. If the disclosure is required or authorised by or under an Australian law or a court/tribunal order. On collection of your personal information, we will inform you whether it is likely we will disclose the information to an overseas recipient and, if so, where those recipients are likely to be located. The Bosco Accounting website uses Google Analytics to analyse aggregate user behaviour. Google Analytics uses first party cookies, which are text files placed on your computer for the purpose of anonymously identifying your session. These cookies are not used to grant Bosco Accounting access to your personally identifiable information. Non-identifiable information (such as the pages you visit) may be tracked. By directing your browser to delete your cookies, this data will be erased. For more information about Google Analytics, please follow the links provided on our website. The information is collected using first party cookies, meaning that only Bosco Accounting is able to access your information. Your information may be aggregated with information from other users for the purpose of improving our website and offerings. We will not associate any data gathered from our website with any personally identifiable information, unless you explicitly submit that information (e.g. your email address) via our online information form. Bosco Accounting may engage in direct marketing to you from time to time. You have consented to the use or disclosure of the information for direct marketing purposes. You have the right to access any personal information regarding you that Bosco Accounting holds. This is subject to some limited exceptions, which the Privacy Officer can provide further information on. Such requests should be made in writing to the Privacy Officer. We will acknowledge your request within 14 days and respond to it within a reasonable time. Bosco Accounting may charge a fee only to cover the cost of locating, retrieving, reviewing and copying any material requested. We will not charge any fee to make the request or to for us to give effect to the request. If your request is approved, we will provide you with access to the information in the manner requested if it is reasonable and practicable to do so. Bosco Accounting endeavours to ensure that the personal information it holds is accurate and up-to-date. Any other matter as prescribed by the regulations. If your request to correct is refused you have the option of submitting a statement associated with your personal information. For more information contact the Privacy Officer. If you consider that any action of Bosco Accounting breaches this policy or the Australian Privacy Principles, you are able to make a complaint. Once we have received your complaint, it will be assessed and acted upon within a reasonable time. To make a complaint please contact us. If you are not satisfied with our response to your complaint, you may contact the Office of the Privacy Commissioner.